I gave a webinar a few weeks back about how to come up with fresh and fun ideas for content marketing using improv comedy. This wasn’t about being funny—it was about using principles from improv to create content with a lighthearted touch to grab attention. “Fun” and “funny” are two different things. One very large, conservative financial firm asked, “How can a conservative brand with a conservative voice use humor? Aren’t they at odds?” No; fun is not at odds with a conservative voice. And I believe that because I’ve seen it. And, yes, I know it’s a regulated industry. I’ve heard this (and written about it) before. I am passionate about this because humanizing brands with stories, content, and creative facilitation is what I do. And I believe in it because it works. Fun is human. I have never met a person who hopes to go through her day hoping to read boring content rather than something that makes her smile, laugh, and learn. The idea that a conservative voice is at odds with presenting important content in a fun, not-so-serious-and-boring way is over-simplistic and detrimental to change. 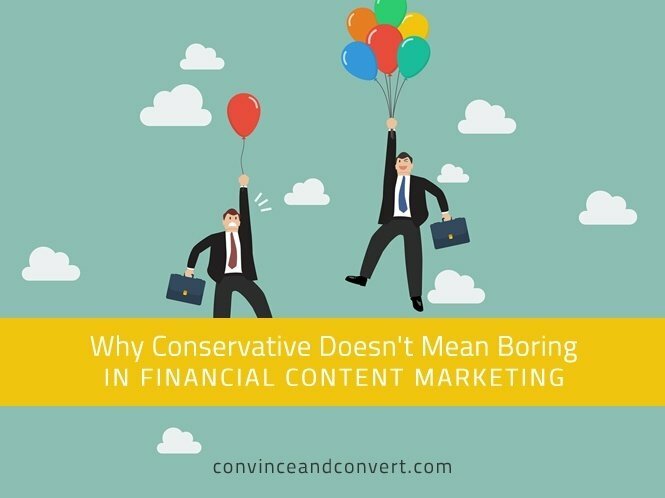 It conflates conservative voice (or market or strategy) with a mandate to have conservative (boring!) marketing content. They are not the same. Moreover, being funny (and using over-the-top humor) is not the same as creating a fun, lighthearted piece of content. In fact, you likely need fun more often than not in boring industries. Customers of financial firms don’t check their human cards at the door when they do business with you. No one does. I recognize that this question comes from a place of fear, misunderstanding, and a lack of comfort with changing communication styles. When well thought-out, however, fun can make a positive difference in engagement and in business for your firm. People are people, as Depeche Mode sang. People don’t want to be bored. They want a reprieve from all the bad marketing content shoved at them every day. There is very little risk in trying small things just to start. The bigger risk lies in doing nothing—most financial marketing is about as dehumanized as you can get. The status quo no longer works in an age of data overload. Consider Millennials: Research shows that Millennials value humor and, yes, want to learn how to invest better. And financial services firms need to attract Millennials and their money. People invest for different reasons. For some, it’s not about the money itself—it’s the freedom money allows them. Then they can live their lives and do what they want. What, then, are their passions? It’s probably not reading your conservative, boring content—unless they need the sleep! No one ever wishes they spent more time banking or dealing with insurance. Marketing is always about people and their passions. Find out what your people care about, and start writing about that. Many financial services firms suffer from a lack of differentiation. It’s a hyper-competitive sector. When you connect at a human level with even a little fun, you show that you are different. You don’t need to go over-the-top crazy; you just need to lighten up a bit to be memorable. Test your stuff on a sample audience of your ideal customers. Design for your ideal market. “But Kathy, we’re different—we’re trusted.” This is the financial version of, “We’re special.” Here’s the reality: You should be trusted, or you shouldn’t be in business. I don’t know of a large market for untrustworthy banks, insurance providers, credit unions, etc. Trust isn’t a differentiation. It’s expected. You can’t claim what’s expected as differentiation. Lightening up will score you points in the human and trust departments. AllState’s Mayhem – This is a great, over-the-top personification of risk. You don’t have to be over-the-top to get a reaction, but in this case, it worked. It deals with fears in a funny way: by grounding fear in unlikely, but possible scenarios we can laugh at. Affinity Plus Credit Union – Tired of being fleeced by bank fees? This video is pretty great. Barclays in the UK – This conservative bank built a popular interactive game to teach kids about money: 56 Sage Street. Wells Fargo – Wells Fargo organized a flash mob in Times Square that became great video/social media content. Umpqua – This bank creates fun videos and has a podcast series aimed at Millennials where they interview writers from SNL among other guests. It’s about more than just money for your customers—it’s about understanding their lives. And this bank does. State Farm – These guys created the disappearing agents commercials and web content that has become so popular. T Rowe Price – This company created a microsite with an illustrated video-storybook to help people set up college funds for their kids. One of my favorite unexpected, successful examples comes from Marketo, an enterprise software company. It’s not a financial services firm, but it is a B2B company that sells to big, often conservative enterprises. Yet, it created a Big Marketing Activity Coloring Book (you read that right) for corporate marketers, and it was one of the most downloaded pieces of content the company created. Not too long ago, I helped a credit union bring in Millennials for a lunch, and we asked them how they would run the bank if they were in charge. They came up with fun and low-risk ideas that are now being implemented, from videos and apps to contests and young entrepreneurs’ events. This is something any firm can do. Some large, conservative firms will claim credit unions are different. Yes, they’re smaller and often have less brand heritage. Yet, when it comes to creating powerful content, they are no different. It has nothing to do with regulations, and boring is not a requirement. Sadly, it’s sometimes an occupational hazard, but it’s never a requirement. Your customers can want conservative investment strategies while also wanting fresh, even fun ways of getting information. You can present serious topics in a fun way. Forget funny—try for fun. Fun is human. To firms that still don’t get it, I understand the fear. But your competition, who is taking aim at younger audiences and busy people (all of whom have data fatigue), will figure it out. And if your marketing doesn’t evolve to capture new ways people receive and communicate information in an age of data overload… well, good luck. The status quo is always an option. But is it the best one?